Here you will come to know about the University of veterinary and Animal Sciences Lahore Hec Need Based Scholarship Program 2019 from this site. 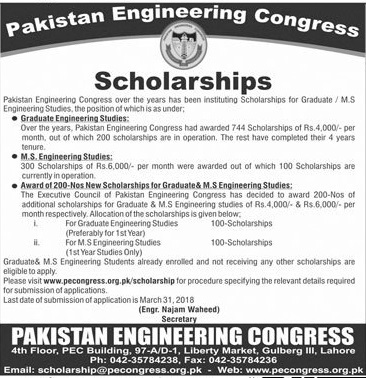 This well reputed university announces different need and merit base scholarship through different schemes including Higher education commission HEC scholarship program. Only those students will be able to get these scholarships who are the students of morning programs including DVM, PHARM D and other equal degree program in this well reputed university. All these admissions will be provided to students on merit basis. The basic purpose of this scheme is to provide financial support to those students who want to get education and want to support their families too. These scholarships are for these students whose family income is equal or less than 45,000 rupee. If you are also interested to apply for this scholarship program than you are at right place. 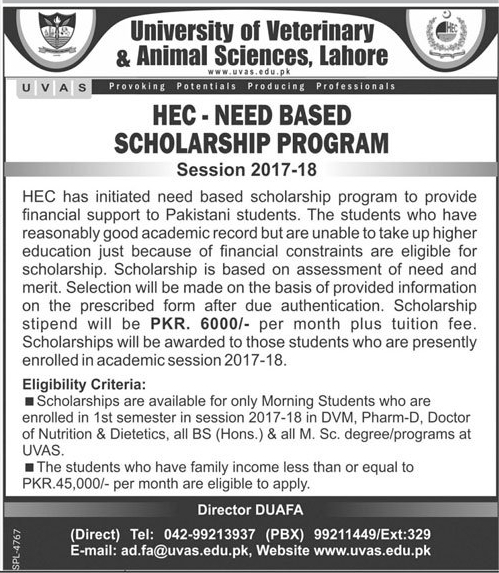 Here you will come to know about the University of veterinary and Animal Sciences Lahore Hec Need Based Scholarship Program 2019 which is listed below on this site for your help. So have a look for more information. All those students who have taken admission in any program that is mentioned on below picture is eligible for this scholarship program. Only those students will be able to get this scholarship who is not availing any other scholarship is not eligible to apply for this scholarship. Only those students will be able to get this scholarship whose monthly income is less than or equal to the 45,000 pkr. These scholarships will be provided to those students who have recently taken admission and are in first semester. Only those applications will be accepted which will receive before last date. All those students who meet with the eligibility criteria can apply for this scholarship program. Those who want to get scholarship can apply online at the site of this university. Application can be fill online as well as can be send through your institute. Late arrival applications will not entertain by the HEC. If you have any question in your mind regarding to the University of veterinary and Animal Sciences Lahore Hec Need Based Scholarship Program 2019 than you can ask from us through comments. We will answer your question as soon as possible. You can also stay tuned with us for further assessment.